The Sheriff’s Office and Sgt. Michael Custer face an excessive force and wrongful death lawsuit over Custer’s shooting of Adams in a Loxahatchee Groves nursery in 2012. The deficiencies Hurley mentioned included investigators failing to measure the distance between Custer’s SUV and Adams’ truck and failing to determine whether it was beer or an iced tea mixture found in a mug left in Adams’ truck. Also, Custer’s boots weren’t taken into evidence that night and in a videotaped interview after the shooting, Custer wasn’t asked to show how he held the gun when he fired. Those unknowns have become big issues in the civil trial nearly five years later. Jurors were not in the courtroom during Hurley’s criticism. Before the trial recessed for the day Wednesday, Hurley warned jurors that the case is getting increased media attention and that they should continue to avoid television news, newspapers and Internet surfing that could expose them to reports about the trial. Jurors examined the faded blue Ford Rander truck Seth Adams drove the night he was shot and killed by an undercover officer. Beside the driver seat of the truck was a glass mug that contained a tan-colored liquid. Custer, 47, testified Wednesday, telling jurors that his late-night encounter with Adams was contentious from the start. Custer, who was leading an undercover patrol, was parked in an unmarked SUV when Adams arrived about 11:40 p.m. at the nursery where Adams worked and lived. Custer, who was wearing plain clothes, said he identified himself as an officer and tried to calm Adams. 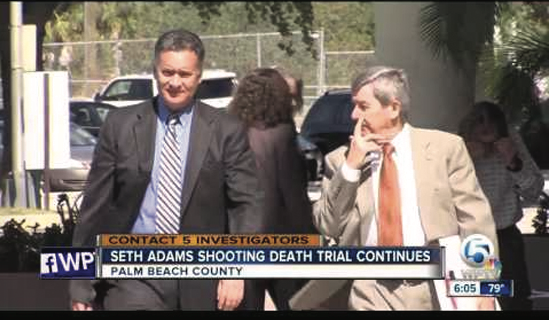 Custer said after both of them got out of their vehicles, Adams grabbed him by the neck. “I never saw it coming,” Custer said. Custer said he was able to break Adams’ grip and, after a struggle, he backed away, pointed his gun and repeatedly ordered Adams to get on the ground. “I’m yelling, ‘Get on the ground! Get on the ground! Sheriff’s Office! … I will shoot you!’” Custer said, yelling in the courtroom as he described the encounter. Custer said he kicked Adams’ open driver’s side door, but Adams got there before the door closed. Custer said Adams was rummaging around in the cab of the truck for something that Custer feared could be a weapon. Custer said he used his right arm to try to pull Adams from the cab of the truck while keeping the gun aimed at Adams with his left. Custer said seconds later, Adams spun toward him and that’s when Custer fired four shots.